We’d always assumed the idea behind the Brew Crew Series at Bad Shepherd was to allow team members outside the brewery to have a crack at designing a beer. 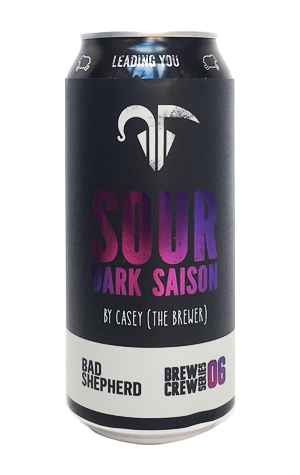 But, clearly, they like to play fast and loose with the rules at Bad Shepherd as, for number six, they’ve invited one of the brewers, Casey, to take up the reins. Whatever the background to the beer, they’re reins he’s grabbed with both hands, creating a funky amalgam tagged a Sour Dark Saison. It's a dark brown, cola like pour in which the "Sour" delivers a cleansing tang and, presumably, contributes to the dark berry / cherry like characters too. Aside from the colour, the "Dark" offers up characters of, chocolate, cola and sarsaparilla, while the "Saison" chips in a drying spiciness. It might sound like a mouthful but it’s one in which the constituent parts all come together rather nicely.